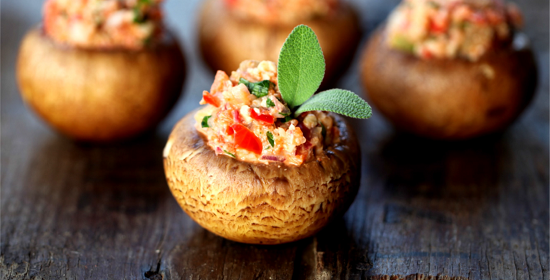 Vegan Stuffed Mushrooms Appetizer – raw vegan or cooked button mushrooms stuffed with yummy walnut mix for a great plant based, low calorie party favorite. DIRECTIONS: preheat oven to 325ºF. Wash mushrooms. Gently remove stems. Taking care to keep mushroom caps intact. Set aside to dry. Add minced red bell pepper, chili pepper [if using], celery, and red onion to a bowl. Or mince everything in food processor and transfer to bowl. In inverted single blender cup or small food processor, add walnuts, lemon juice, oil, salt, and 1/8t pepper. Peel and press garlic cloves into blender cup. Blend until thick and creamy. Mix into the bowl of minced vegetables. Mince fresh herbs and add to bowl. DIRECTIONS: stuff the mushroom caps, lightly dust top of stuffing with chipotle pepper, and serve. DIRECTIONS: rub dried mushroom caps lightly with oil, stuff them and place on parchment lined baking sheet. Bake for about 30 minutes or until mushrooms are cooked. Serve immediately. DID YOU KNOW THAT CRIMINI MUSHROOMS ARE BABY PORTABELLA MUSHROOMS? They’re also called Baby Bellas. When portabella mushrooms are harvested in their button stage, they’re considered crimini mushrooms. Since they’re drier and more dense they are a superior alternative to the traditional white button mushroom. This makes them better for sautéing. It also makes them meatier which is better in most recipes. You can even grow your own Crimini Mushrooms from a kit! 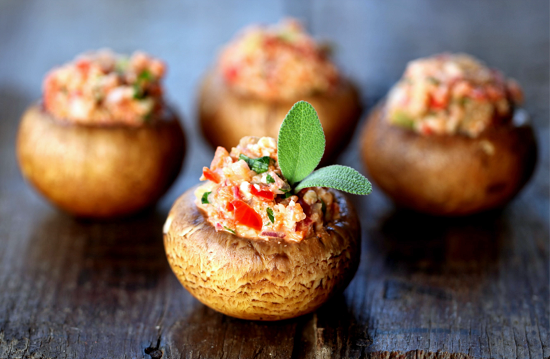 Metatags: Vegan Stuffed Mushrooms Appetizer – raw vegan or cooked button mushrooms stuffed with yummy walnut mix for a great plant based, low calorie party favorite. Absolutely loved these Vegan Stuffed Mushrooms Appetizers. Super YUMMY & DELISH!